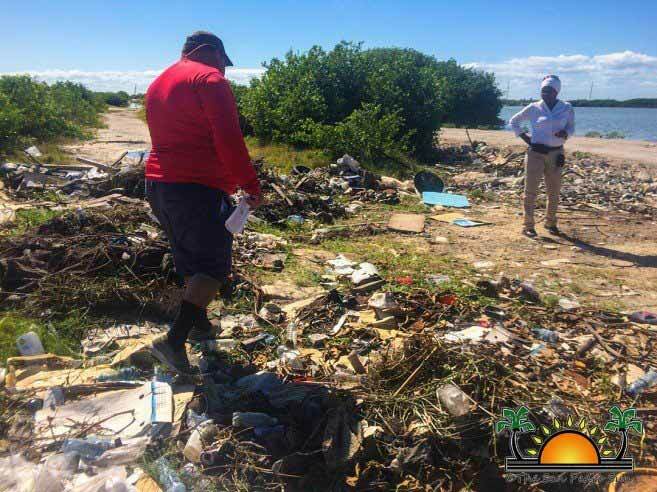 Improper and illegal garbage disposal in San Pedro Town continues to be a big problem, and authorities at on the island like The San Pedro Town Council (SPTC) seem to be moving a little too slow to address the issue. One reported situation is the recent dumping next to the San Pedrito Highway, adjacent to the airstrip. The blatant move clearly identifies the possible origin of the garbage, which includes old restaurants menus, old cheques and even personal information of past customers recorded in receipt books for golf cart rentals. When the dumping was reported, Mayor Guerrero was immediately provided with images and informed of the location of the dumping. Guerrero, who has pledged zero tolerance to this practice, told The San Pedro Sun that the garbage would be picked up the following day. The Sun followed up with a visit to the area and noticed that nothing had been done. The issue became more alarming after discovering among the discarded items golf cart receipt books from Tropicana Golf Cart Rental, complete with past clients’ credit card information still on them. The business, located on Coconut Drive, operates next to the recently opened ‘My Place Steakhouse,’ which was formerly Tropicana Restaurant. Meanwhile, the garbage remains where it was dumped, along with the personal information from dozens of costumers, who at some point, rented the services from Tropicana. Check out the lot next to 777grocery, right next to Holy Cross School, I was promised that would be looked into also...….again nothing done!! Great representation for the kids who have to walk by this dump everyday! Why should our youth care? Our paid leaders don't !!! That is just totally unacceptable. The owners of the business it came from should be heavily fined. I would also suggest being placed in shackles and publicly humiliated in the town center, but I don't think that is legal anymore.